UDM Downloads > Easy Invoice! Easy to setup, and very easy to learn Invoicing program with powerful features. This is a perfect solution for small to mid-size Business. 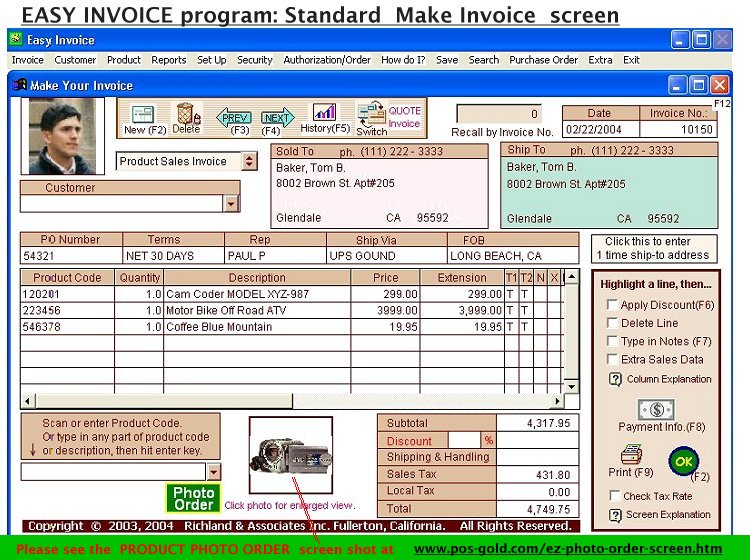 Easy Invoice provides Product Sales, Services and Professional Invoice format, Quotations and Packing-Lists, Sales History Reports, Inventory Control, shows Product and Customer's Photos, generates Sales Journal, Gross Profit Report and various Sales Analysis Reports, provides Customer Pricing, % or dollar amount Discounts at Line and Total levels, space for ample Notes at line, at total levels, and Option to send Invoice by e-mail. Downloads sales data to Excel and Quickbook Interface files, provides Network Option for multiple users, User Access Security, also provides Various Features for International Users such as multiple taxes, Merchant's ID, Currency, Date format, etc. and shows Help Screens and Pop-up "What's This" help. </P> - Long-term free evaluation period to make sure you are in business.